“We can only be said to be alive in those moments when our hearts are conscious of our treasures.” Thornton Wilder was an American playwright and novelist. In yesterday’s blog, I wrote about various ways to be heartful. One great way to a heart full of love is GRATITUDE. It is well recognized in positive psychology that gratitude alters our outlook of life and impacts our positive feelings and emotions. By simply recognizing with gratitude how fortunate we are for all the things we have (and have taken for granted), we can be both happier and respond to life in a much more positive fashion. With a grateful mind and heart, we will most likely also attract more of the things we want, wish or hope for. We might be complacent and not very happy. Or we might have a mind that is often in a critical modus looking for what is not working. With a mind programmed to continuously change and improve things, there is a risk that we see life through a lens where the glass looks a bit half empty rather than half full. With this outlook, we don’t tend to take a pause and feel gratitude. If you recognize yourself in this description, you may forget to stop and celebrate and feel grateful for the improvements you are making and the successes you have. As soon as you have achieved something, you look for something new to chase rather than stop, savor and be happy for what you have. When our heart is not full, we strive to accomplish and have more with a hope it will fill the empty feeling we carry in our hearts. I used to be one of those people with a whole in my heart, striving to continuously change and improve. I did not sense gratitude often enough in my daily life. So when I one day woke up and realized that I had been looking for happiness in the wrong places, I instead began to notice all that I was fortunate to have, and all that was working in my life. With this simple shift in attitude my life took on another turn and gave me more and with less effort. 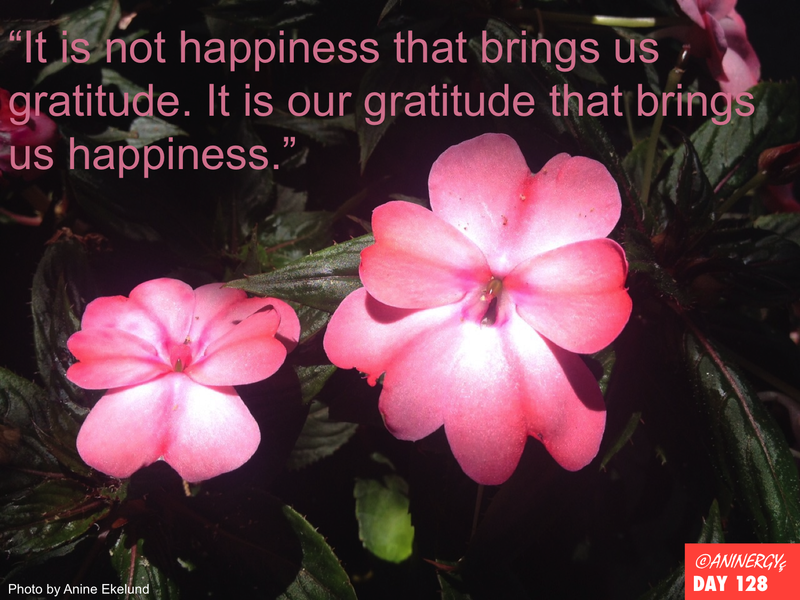 The attitude of gratitude has brought richness into my life on many levels – among them, I very often feel heartful. I also enjoy expressing gratitude towards my husband, which he of course appreciates – and I have noticed that the love between us has grown as a result of it. Categories: alive, doing vs being, emotional, energy, gratitude, happiness, harmony, inner peace | Tags: attitude, gratitude, heartful, paradigm shift | Permalink.